Yoke style wall mounts offer a new design that allows users to construct the platform and mount the TV on a floor or a table and then lift the unit into place on pre-mounted arms. The mounts are height and width adjustable to accommodate monitors ranging from 25- to 35-in, and feature a black powder paint frame constructed of 14 gauge steel with 1- × 1.75-in. steel tubing for the telescoping center beam and 0.25- × 2-in. steel for the yoke arms. The mounts are UL-listed for safety and feature a dual upper clamp system on the yoke arms to prevent the monitor from sliding forward or backwards, as well as an adjustable lower tray for added stability. 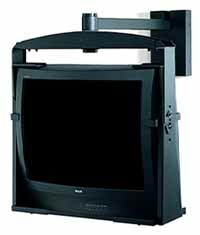 They offer a 360° swivel with a 0 to 30° tilt capability for exceptional viewing angles in any size room. In addition, the mounts feature a wall bracket assembly with knockouts for electric and antenna leads, a cover for the back wall mounting plate, and optional security screws to increase tamper resistance. The mounts are available in two models. Model TVWW3027-BK weighs 38-lb and measures 24.375- to 31.5-in. × 23.875- to 27.875-in. × 10-in. (W×H×D). Model TVWW3035-BK weighs 48-lb and measures 28.875- to 35.875-in. × 30.0 to 38.5-in × 14-in. (W×H×D). The wall yoke mounts come with all hardware needed and ship ready to install. The manufacturer offers a variety of additional mounting options. Bretford, 11000 Seymour Ave., Franklin Park, IL 60131. Tel: 800-521-9614 or 847-678-2545. Fax: 847-678-0852.